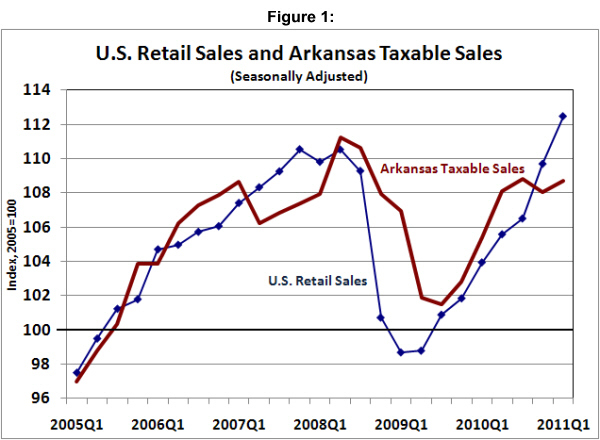 Preliminary data indicated that Arkansas Taxable Sales (ATS) increased only modestly in the first quarter of 2011 (+0.7%), and had shown little net growth over the past three quarters (+0.6%). Based on information released last week from the Arkansas Department of Finance and Administration (DF&A), revised statistics show an even smaller increase in the first quarter, +0.6%. As shown in Figure 1, the sluggish growth in ATS since mid-2010 contrasts with national retail sales statistics, which have shown steady recovery from the recession. 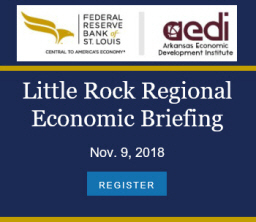 In the Arkansas Economist report on the preliminary figures we speculated that the difference might be related to the recent spike in gasoline prices. (This factor was also mentioned in the most recent General Revenue Report from DF&A.) National retail sales statistics from the Census Bureau include expenditures on gasoline. 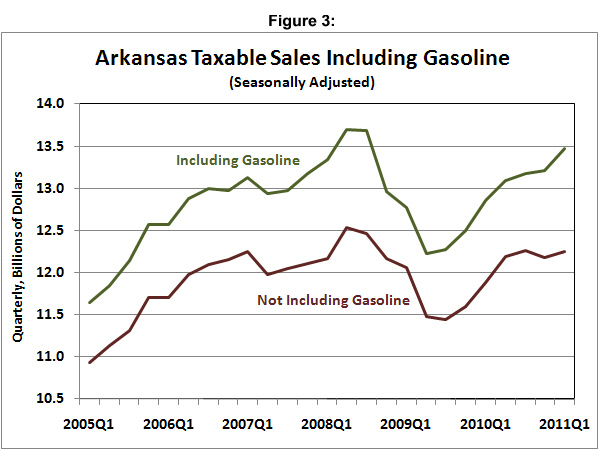 But because gas is not subject to sales tax in Arkansas, it is not included in ATS. As shown in Figure 2, the share of total U.S. retail sales reported at gasoline stations varies directly with the price of gasoline. In the short run, the demand for gasoline tends to be price inelastic — that is, the quantity of gasoline purchased remains fairly stable when prices change. Consequently, an increase in gasoline prices raises the share of total spending devoted to gasoline. Arkansas Taxable Sales includes the non-gasoline items that are sold at gas stations, but it doesn’t include the gasoline iteslf. When gas prices increase dramatically, this means that ATS is missing a component that is of growing importance. Although gasoline is not subject to sales tax in Arkansas, it is subject to a motor fuel tax that is assessed per gallon sold. Therefore, the Department of Finance and Administration has monthly records of the quantity of gasoline sold in the state. Multiplying the quantity sold by the average price for gasoline in Arkansas (obtained from the Oil Price Information Service), we can construct aggregate gasoline sales to be included in an expanded measure of ATS — Arkansas Taxable Sales Including Gasoline (ATSIG). Figure 3 compares ATS with and without this newly-constructed measure of gasoline expenditures. The data that include gasoline sales show considerably greater strength in recent quarters than the original version of ATS: In the past three quarters, ATSIG has grown by 2.8%, compared to the meager 0.6% growth without including gasoline expenditures. The difference is particularly marked in the first quarter of this year, with ATSIG expanding by 1.9%. 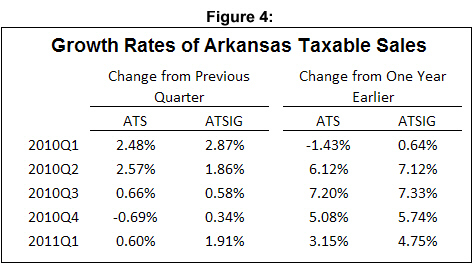 In the most recent two quarters, ATSIG shows that total sales growth in Arkansas expanded more than 1% per quarter faster than ATS (without gasoline) suggests. 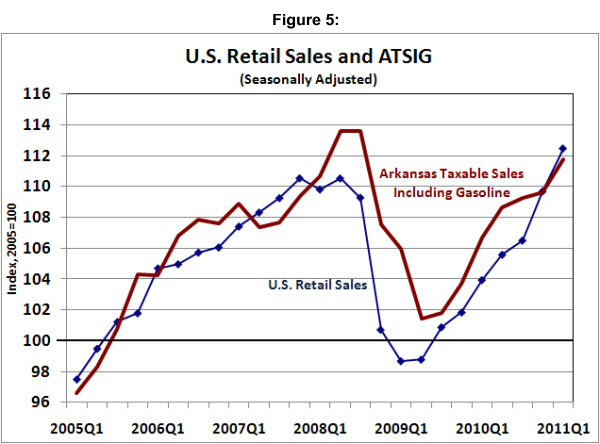 With gasoline included, the recent growth of taxable sales in Arkansas more closely mirrors the statistics on national retail sales, as shown in Figure 5. So how should we interpret the surge in recent spending on gasoline? From a strictly utilitarian standpoint, it is appropriate to include gasoline in total sales so that it more closely matches the U.S. Retail Sales statistics. But the economic significance of an increasing gasoline share in total spending is trickier to evaluate. To the extent that a gasoline price increase is considered permanent, it should have a negative wealth effect that reduces overall spending. On the other hand, a temporary price spike should have negligible wealth effects, but might induce households to borrow more and/or save less in order to maintain planned spending on non-gasoline items. This is likely to be a factor in explaining the sharp surge in ATSIG in response to the surge in gasoline prices in early 2008. But, if households are effectively credit constrained, the increased spending on gasoline is likely to crowd out other spending — leaving total spending at about the same rate as it would be without the gasoline price spike. The reaction of non-gasoline spending to the 2011 price spike suggests this scenario might be relevant for interpreting recent data. 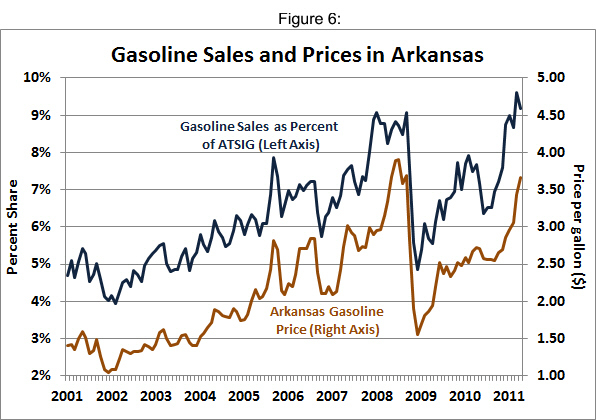 The difference between 2008 and 2011 is illustrated in Figure 6, which shows the gasoline expenditure share in ATSIG alongside Arkansas average gasoline prices. In 2011, the rise in gasoline prices was slightly smaller than the 2008 spike, but the share of spending on gasoline has exceeded the 2008 peak. 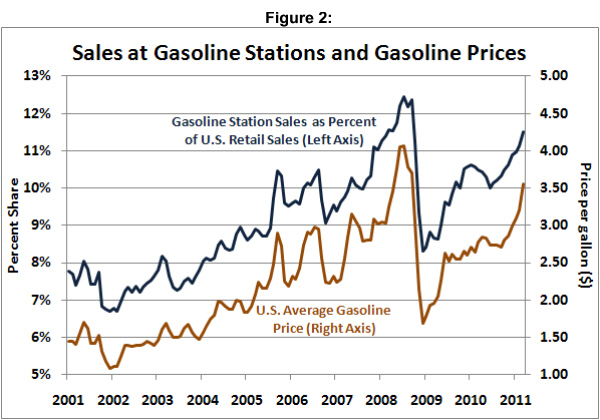 This indicates that the 2011 price surge has resulted in a larger cut-back in non-gasoline expenditures. Gasoline prices have fallen considerably in recent weeks. According to the AAA Fuel Guage Report, gasoline prices in Arkansas have declined by nearly 23 cents over the past month. This is likely to reverse the substitutions we’ve seen in the early-2011 data, with non-gasoline items again constituting a larger share of total spending. For state general revenues, which depend heavily on sales taxes, this should result in more rapid growth for the remainder of 2011. A spreadsheet with data for ATS and ATSIG is available here.